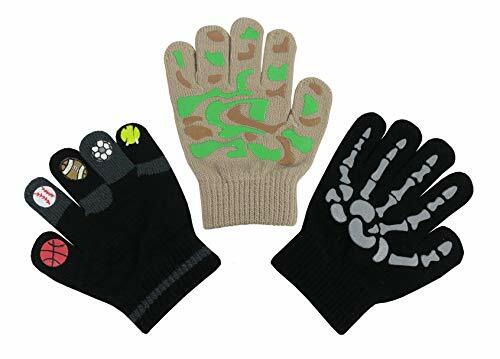 N'Ice Caps Boys Magic Stretch Gloves 3 Pair Pack Assortment. Sizes: 3-7 years, and 8-14 years. Several packs include one pair of touch screen or one pair of double layered gloves, as pictured. Packs to choose from include printed designs of sports balls, skeletons and skulls. All 3 pairs in packs are different colors or prints. N'Ice Caps original design. Tested and approved as per CPSIA standards.